I was prompted to reflect back forty years ago today on the anniversary of the Kent State Massacre of May 4, 1970. 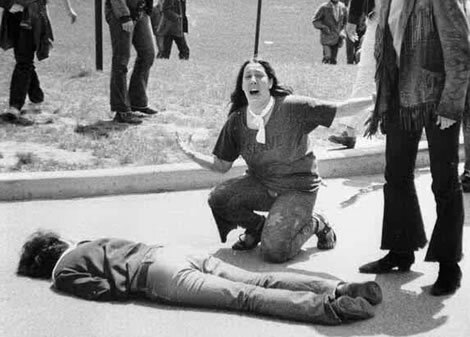 Looking back, I think the Kent State Massacre did play a significant role in shaping my political consciousness, as a true child of the Sixties. In May, 1970, I was a nine-year old fourth grade Jewish-American student growing up on Long Island, NY. My family was against the Vietnam War and I was too, based mostly on a child’s gut feeling against killing human beings. “War is not healthy for children and other living things” seemed to make sense to me. The Kent State Massacre did hit home. My mother, the school librarian at JFK High School in Plainview, NY worked with the mother of Jeffrey Miller, one of the four students killed at Kent. She attended his funeral. It truly did seem like the war was coming home. My older sister Nancy was getting ready to enter college that fall in Ohio at Case Western Reserve University, not far from Kent State. A friend of hers was planning on going to Kent State. I feared for both of their safety. At some point, maybe months later, Nixon made a comment about college protesters being a bunch of “bums.” I was insulted for my sister and her friends. My mother encouraged me to write a letter to the White House taking exception to this. Months later I got something back that included policy statements supporting U.S. intervention in Southeast Asia. I remember thinking they used a lot of words to say something that didn’t make a lot of sense to me. Months later, my fifth grade teacher, Mrs. Schultz, an extremely ideologically conscious right-winger made some remark about the killings at Kent State had been justified because (and I remember her exact words) “they needed to teach those rabble rousers a lesson”. I was very upset by this comment given how close Kent State hit home. I didn’t know what a rabble rouser was, but I think it was at that point that I started to identify with them. 2. Nixon Kicks It Off! And hopefully there are more to come.